I've been thinking hard about downsizing ~ again! It's an ongoing topic for me, and an area where I really feel like God is teaching me. I'm not always a willing learner, being a bit of a pack-rat. Yet I crave calm, serene interiors; an almost monastic appearance. Minimalist, but with a touch of comfort and warmth. As part of this, I dream of one day retiring, selling the house, and setting off to see the country and the world with an RV or Tiny Home. As part of this process, I've been doing a lot of reading in addition to a lot of purging of belongings. One of the books I've really liked has been; Let It Go, by Peter Walsh. As part of the process he recommends, he suggest thinking about the things we own that are most important to us. I decided to write some essays on my items and do some watercolor sketches or photographs of them, and then I thought that some of you might find them interesting. My Bible was given to me by my Mom and Dad upon my graduation from High School. Up until that time, I used a small old black bible, which I later covered in fabric (playing with fabric and stitches even back then!). I think I got that original Bible when I was in Elementary school. Most of the kids had gotten theirs as part of the promotion from early elementary church school to 4th grade. But I didn’t attend Sunday School with my peers, instead choosing to help out in Primary Church, which was Kindergarten through Second or Third graders. Because I wasn't in Sunday school class with my peers, I never participated in any of these activities. I think that my Mom had the church give me my copy at some point. Later, once I was in school at the University of Denver, I gave my old Bible to my friend "J". She became a Christian while we were freshmen in college and didn’t have a Bible, so I gave her my old one. Later she told me how much it had meant to her to read it and see the things I had underlined. 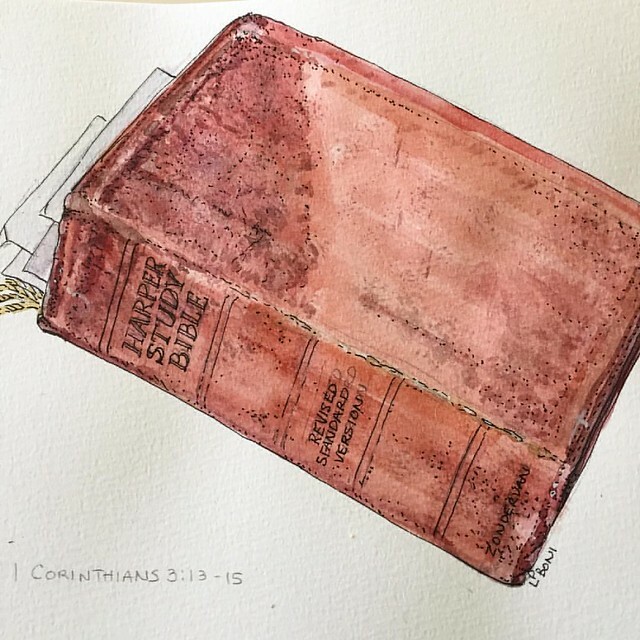 When Mommy and Daddy gave me my new Bible; a Harper Study Bible, Revised Standard Version (which is what we used in church until shortly after that when the New International Version came out), I was a bit disappointed. Most of my friends had received “big” gifts for graduation ~ cars, jewelry, trips, etc. But at the same time, I was glad of it, as I had long wanted a good study Bible. In hindsight, the Bible was the far more lasting gift. Any of the other things would have passed by the wayside, but my Bible still gets regular use. At times, I use an English Standard Version, which has better pronoun usage (doesn’t use “He” for every time a person is implied) and it removed some of the archaic language with all the thee’s and thou’s, making it easier to read. But I still go to my old RSV Harper Study Bible most of the time. It has my notes, my underlinings, and I know where to find things in it. God gave me a second chance ~ a chance to redeem myself, to renew my faith, to rebuild on the solid foundation of His word. Every time I open my Bible, I am reminded of God’s grace to me and to our family. This gift of a Bible, is also emblematic of the legacy of faith sent down from generations past. From my parents and grandparents, and from the ancestors before them, many of whom came to this country seeking that freedom to worship. It's something I cherish and am grateful to know that this faith has been passed down to my children and they are passing it on to their own children. Truly a blessing. There is none greater! Ever since I was a young child, I’d been fascinated with houses and floor plans, often creating floor plans out of blocks, American Bricks, or Lego blocks. When other people were playing with dolls, I was more interested in the houses they might live in. Why it never occurred to me to pursue a degree in architecture, I have no idea. I wanted to take Drafting in High School, but could never fit it in my schedule between choir, and other classes that I wanted to take. By the time I was in college, I was starting to put my house plan ideas on paper and my sketchbooks were filled with ideas for log cabins and English style cottages and their plans. By the early 1990’s I became fascinated with the idea of tiny little houses and started reading all the books I could find about little houses. Walden, by Henry David Thoreau became a favorite as did the Outermost House by Henry Beston. When Country Living or Country Home magazine had an article on historic little houses, I clipped it out and saved it. I became fascinated with vernacular housing ~ the houses that people built for themselves. Somewhere along the way, I read an article about someone who made a complete little house out of an ice fishing shack. They could sleep, cook, stay warm, etc in this tiny 6’x8’ shack. I became enamored with the idea of building a tiny little place, complete as could be. Shortly after this, I found the book, Tiny Houses by Lester Walker. I was off and running! In the early 1990s, realizing that we were headed toward divorce, I knew I needed to find a way to earn a living. At first I wanted to become an interior designer, but the only school was too far away, so instead I settled for the Architectural program at Front Range Community College. I never completed the degree, being shy a physics class, a math class and another computer drafting class. But before I completed my studies, we had separated and I found a job doing structural drafting. Doing floor and roof structure plans was a far cry from interior design, but I got to play with plans, not only for commercial buildings, but some for houses too! My interest in tiny houses continued and with my new knowledge of structures, my designs improved. I became enamored of one design in particular, which I called Rosebud Cottage. At a mere 192 square feet, it contained everything I thought I would need. Then I added a small conservatory to it and it was perfect! 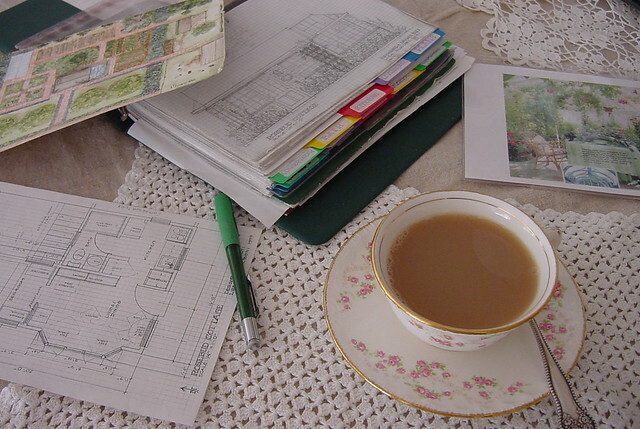 I would work all day drafting floor and roof structures and then in the evening, if not teaching childbirth classes, I would come home and work on Rosebud Cottage plans! By the end of 1997, I had it completely designed, down to what books were on the shelves, what dishes and cooking utensils were in the cupboard and what my wardrobe would contain. I even did a landscape plan complete with gardens, room for a pasture with a few sheep, a greenhouse to grow sweet violets in and garden space for growing sweet peas and roses as well as all my vegetables and herbs. My kids were taken with Rosebud Cottage as well and for Christmas that year, my gifts were 2x4s and a tool belt to help me build it! I had other ideas too and they grew into Ivy Cottage, Oak Cottage and into many other designs. All these ideas were housed in my little Rosebud Cottage notebook. After our fire, I was distraught about losing this notebook. It was probably the hardest of all the losses other than the kitties. My dreams were gone. Oh what a joyful day when we moved a pile of unsalvageable, fire damaged items and underneath it found my Rosebud Cottage Notebook, though smoke stained, it was virtually unharmed! I was able to put the pages into a new notebook, clean the smoke tinged pages and today it remains intact (and has been added to since then!). I guess that in some ways, Rosebud Cottage is the epitome of my dreams. A tiny jewel box of a cottage set amongst lush gardens surrounded by woods. Out in the quiet, away from the bustle of modern life. It was/is my escape, a little haven. It’s morphed over the years and now there are several slightly larger modifications of the design that perhaps might be more livable in the long run, but in reality, Rosebud Cottage holds everything I hold near and dear to me, except my family. And for that, I designed a large all season lodge, complete with kitchen, lodging for all the family, and a large gathering room. When the family isn’t there, it can be closed up, but when the family comes, it’s open for all. I still dream of building my Rosebud Cottage one day! I’ve loved to sketch and draw as long as I can remember. But it was while I was in late elementary school or Junior High that I became enamored of the watercolors of Beatrix Potter, Racey Helps and Jan Brett. By the 9th grade or so, I was creating endless little paintings of mice and rabbits in dresses and britches and trying to create stories around them. Truth is, I was a better painter than story teller! 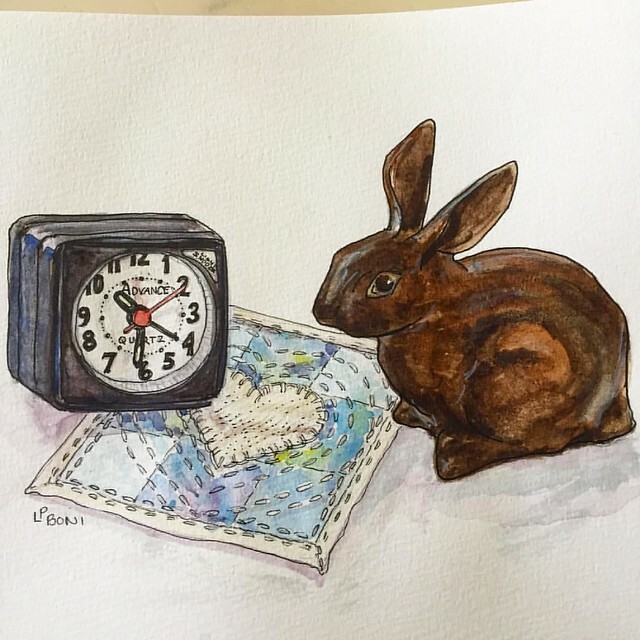 Eventually, I wanted to do better watercolors, so I copied many watercolors of Beatrix Potter. I continued to sketch off and on, but without much direction and always felt a little frustrated that I wasn’t able to achieve with them, what I wanted to. Then in the early 1990s I believe, Mommy gave me an article out of a painting/art magazine about dry brush watercolors. It had a step-by-step lesson, which I did. From that lesson, I went on to do a watercolor for my Dad for his birthday, which I know have. It set in motion a whole new era of watercolor for me! Then, when I was in nursing school in Iowa in the mid 2000s, I found a website called Wet Canvas. It had forums on every kind of art imaginable. I started oil painting again, and I started participating in their Artwork from Life forum. Every 9 days, they posted a list of 28 items and we sketched and shared these drawings online. It wasn’t long before my sketches went from pencil to pen and ink and then watercolor and ink. With this regular work, I started filling small sketchbooks with sketches of things I would never had thought to sketch. I learned to combine different items into a single sketch and to think creatively. Around this same time I discovered the value of adding a border around my drawing. For some reason, that border was a huge help in getting me to think creatively. Now, I carry my little watercolor kit every where I go (except to work) and have found that I love the little Moleskinne watercolor books to be my favorite. I take them on my travels to record my impressions and I use them at home for when i work on sketches of my home or yard. From time to time, when I’ve been in a slump artistically, I go back to the scavenger hunts and participate, even though I rarely post in the forum anymore. I got started with the Scavenger Hunts when they were on list 7 or 8. Now they are up into the mid hundreds! I haven’t done all of them by a long shot, but they really made the biggest difference in my art! When we had the house fire, I had been working on some watercolors. They were in a pale green tin about the size of a breadbox. It was filled with sketchbooks and paintboxes and brushes and there were several drawings on the table. I lost all of them. It was a heartbreaking loss and so when my fellow childbirth educators wanted to do something special for me after the fire, they replaced my watercolors and provided me with new sketchbooks! It was such a meaningful gift. Now when I see these ladies, they always ask to see my latest work! 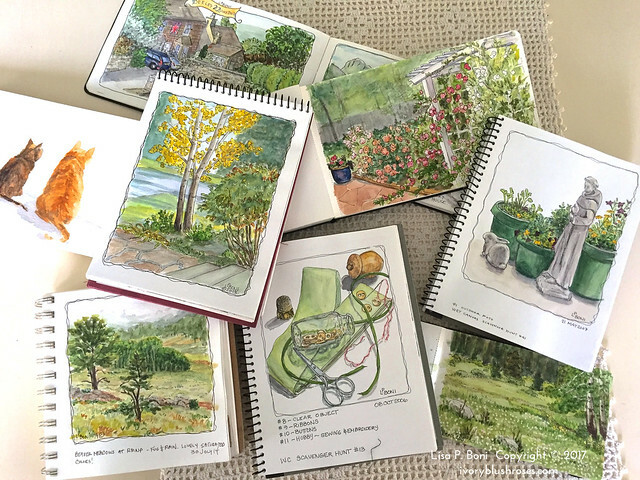 Over the years, my watercolor sketches have included everything from the kitties, to my home, my vacations, the light across the view from my window, etc. Sometimes it’s just a collection of found objects. Of all the creative things I do, the watercolors provide the foundation and are the one thing that I hope to always do, even if some of the other things, such as stitching or spinning, fall by the wayside. They are a record of my life, of the things that have captured my attention or played a role in my life ~ or sometimes, just the whimsical items that fulfill a scavenger hunt requirement! Beside my bed are three items. It may seem a funny thing to have on my “Important to Me” list, and to warrant a place right near the top of the list, but these three things help me feel at home. After the house fire, the biggest loss for me was my sense of place. I had lost my nest. It wasn’t the stuff so much, as I had lost the place where I felt safe, cozy and comfortable. I learned pretty quickly that it really wasn’t the things that mattered so much - those were replaceable. And I loved that I had an excuse to go antiquing and the opportunity to create a new nest. But it took a long time to regain that sense of cozy comfort and safety. About a year before the fire, I had made a trip to Seattle for the wedding of a friend. It was my first vacation since I had gotten divorced and my first real travel adventure without the kids. While in Seattle, I saw lots of the sights, but one of the most memorable days I spent wandering through the Washington Arboretum in a cool, misty, rain. The snowdrops and hellebores were blooming as were the witch hazel trees and camellias. It was a magical day. At the end of the day, I stopped in the little gift shop to buy a postcard. There on a shelf was a little bronze rabbit with such a sweet face. I couldn’t really afford him at the time, but that sweet face called to me and so after much debate over the cost, he came home with me. He gladdened my heart then and continues to do so to this day. I wrapped the little bunny in heavy tissue paper and tucked it in my bag. As I headed home at the end of a lovely week, as I was going through airport security, when all of a sudden the lights and alarms went off and they pulled me aside. I could not think what they had found. I got a pat down while they searched my bag. Then the little Asian security lady held up my bunny like a trophy and laughed with glee, calling out, "It's a bunny!" as she showed all that what had set off the alarm! They made me promise to never put a metal object like that in my carryon bag again before they let me go on my way! Once home, I put him on the desk beside my bed and he brightened my mornings! I also had a little battery operated alarm clock there, with a dial rather than digital numbers. I found the ticking to be soothing and liked that it didn’t glow into the room at night, but that I could pick it up and with the press of a button discover the time. It was just an inexpensive little clock, nothing fancy at all. When the alarm is set, it goes off with a pleasant beep-beep that doesn't "alarm" me when it goes off. Waking gently, is something I value deeply! It helps the day off to a better start. Now, in part due to working nights, I find I rarely need to set the alarm, as I nearly always wake before it goes off. I set it anyway as insurance! When we went through the house after the fire looking for things to salvage, there was my bronze bunny, none the worse for wear other than a coating of smoke that scrubbed off leaving him a bit darker than he’d been before. Within a week or two of the fire, I was grateful to be able to find a replacement for my little alarm clock, which had not survived the fire due to the heat. Once again, I had these two familiar items at my bedside. They make me feel at home during a time when we had none. Since then, I’ve added another little item to my bedside; a tiny hand stitched pocket prayer that I made for my Mom when things were getting difficult with my Dad’s Alzheimer’s to remind her of my love for both of them when I wasn't there. As my Dad lay dying in hospice, she kept in on the pillow next to his head as a symbol of our love for him. After she passed away, I found it on her bedside table next to her bed. Now it rests beside my bed and the bronze bunny often sits on it. It serves as a reminder of my parents and the love we had for one another. As I said earlier, it may seem strange to consider this little trio of objects some of my important treasures, but it is a grouping of items that says "home" to me. It reminds me of my family, of comfort, and of my joy in the little things. What a lovely and interesting post! Your last photo made me search out that little clock. I don't 'need' an alarm clock, but want a clock where the hands are lit. I do NOT like the digital clock that lights up the whole room. An interesting post and an excellent way to organize your thoughts and memories. My husband never wants to give up anything. If I gather a box for Goodwill, before it leaves the house he goes through it and sneaks out to his workshop whatever he thinks we should keep. He is always complaining that I am always throwing his stuff away. The kids just laugh because they know him well. I wonder what I would write about the items that are special to ME.